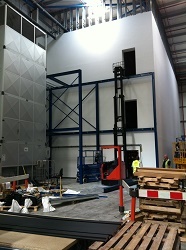 Warehouse Storage Solutions was invited to tender for EDM’s new state of the art Gas Suppression Room in Leeds. The room is designed to store deeds and other important documents that cannot come in contact with normal water suppression systems. After exploring different options, EDM awarded the contract to Warehouse Storage Solutions to build Europe’s tallest Gas Suppression room. 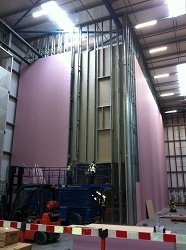 The contract commenced with building a twin jumbo stud wall at 15,000mm high externally x 20,000mm long x 10,000mm wide. 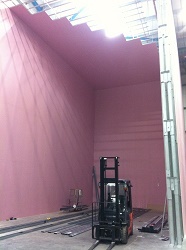 The internal and external walls were then plastered to ensure that the room would pass the compression integrity test. 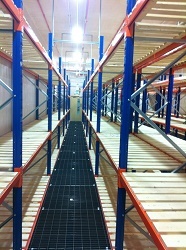 Once built a small opening was left to build a 3 Tier Racking System with steel mesh walkway decks. By building the structure on 3 levels this meant EDM could offer secure storage areas to their clients as each floor level has its own secure entrance. 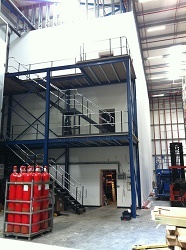 Outside of the GS Room, a 2 Tier mezzanine floor was installed to access all levels. Warehouse Storage Solutions were also tasked with installing all lighting, smoke detection and installing a temperature controlled system. This was a very difficult system to design with it being the tallest Gas Suppression room built in Europe. When the design was completed and agreed with EDM the hard work then started on commencing the build. Because of EDM’s commitment to meet their client’s timescales, the project build programme was dramatically reduced from 12 to 5 weeks. This put even greater pressure on us to complete in time, however by extending our working hours and including weekends we managed to meet EDM’s deadline. One of the most difficult parts of this project was to ensure that the GS Room passed the integrity test. The norm is to hold the pressure for 10 minutes, the best is usually around 20 minutes. Our design and installation gave a 50 minute holding, which we are informed is one of the most secure Gas Suppression rooms in Europe. 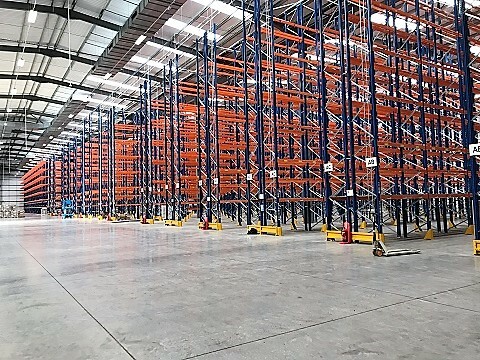 The contract was such a great success, EDM rewarded us with another blarge racking contract at their other site in Wolverhampton.